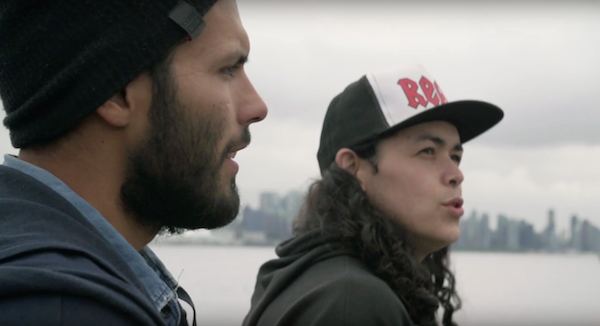 Last month woke hip-hop duo Mob Bounce released "Mob Medicine," a short documentary about their journey in finding themselves and empowering native communities through their music. “We started getting our ideas out and it’s like we just started created this whirlwind of thoughts which slowly turned into action and looking at us today, that’s become our healing tool,” Travis Adrian Hebert aka Heebz the Earthchild (Cree/Métis) says of Mob Bounce’s beginnings. Like many Indigenous youth, Travis and Craig grew up with a loss of their cultural identity, but discovered that hip-hop was the vehicle in which they were meant to share their experience and spread knowledge to others who have gone through similar experiences. “I feel like our music is good for the youth and for the people who need healing in the sense that we bring terminology to that social awareness," says Craig. "Eventually there’s just layers and layers that will peel apart and it creates a lot of healing for the youth who had to experience a lot of the same things say me and Travis experienced in our communities."